Knowls Dev. 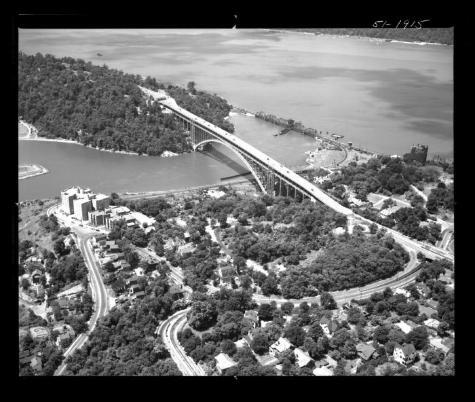 Parkway and Kappock Street, N.Y.
View of the Henry Hudson Parkway crossing over the Harlem River from northern Manhattan to the Spuyten Duyvil section of the Bronx in New York City. A smaller railroad bridge crosses the mouth of the Harlem River where it empties into the Hudson River. Source: New York State Archives, Aerial photographic prints and negatives of New York State sites, 1941-1957, B1598-99. Box 3, no. 22.